Spotted on Shelves… Trader Joe’s Edition! Creamy Mexican corn salad is mind-meltingly delicious. Well, get excited for this fresh & hearty grain-boosted favorite! Complete with veggies, quinoa, brown rice, cotija cheese, and a yummy cilantro dressing, it’s basically the most satisfying salad this side of the border. Enjoy it as a side dish, or mix lean protein into a double serving to make it a meal! 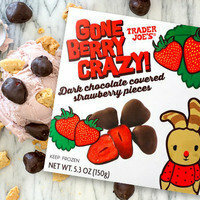 Trader Joe's Gone Berry Crazy! and Gone Bananas! If you like a good low-calorie non-dairy milk, this one needs your attention! 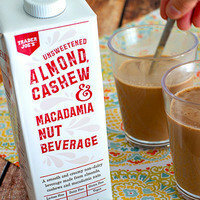 It’s made with a blend of three tasty nut milks: almond, cashew, and macadamia. The flavor is mellow and creamy... and the nutritional stats? We're nuts about ‘em! Try this in your hot or cold cereal, coffee, and any Hungry Girl recipe that calls for unsweetened almond milk. July is National Grilling Month! We think that corn & quinoa salad would be amazing alongside Saucy BBQ Seafood Skewers, don't you? 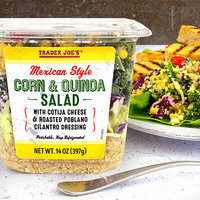 Share the Trader Joe's finds... Click “Send to a Friend” now!